02/18/2019 I couldn't have been more pleased with Jerry's Kitchen. The food truck showed up on time, it looked great, and best of all the food was really amazing. Anyone who knows me will tell you I'm very hard to please when it comes to food, and I'm very open and honest with my thoughts on the taste of what I'm eating even if it's my wife or mom cooking it. This food was really great, couldn't have been happier. Thanks again for helping make my party what it was, we'll definitely be using you again! 02/06/2019 We had an amazing experience with Jerry’s kitchen for our 60+ guest Super Bowl party. They arrived on time, pulled right up to my side door & we’re ready to serve when my guests arrived! Everyone loved the food & they had great options for the kids too! Having them handle the main course for the party ( I just had some dips and picky foods inside ) allowed for simple planning & set up & a lot less to clean up! I was actually able to enjoy my party - Can’t wait to have them again! 02/05/2019 We have used Jerry’s a couple of times and each time it has been amazing!! They are always on time and the food is delicious. 11/27/2018 Jerry's kitchen came through again for the second annual Saturday after Thanksgiving party - on time (way early in fact) - in the rain - ready to go. Variety and quality of food is great - everyone loved the food truck again - and clean up is so easy. Thanks again - see you next year!! 11/16/2018 We did a client appreciation lunch with Jerry's Kitchen food truck. From the initial contact to the finished product, everything was perfect and we impressed our client! Staff, food and experience was A++++++ HIGHLY Recommended! 11/06/2018 Amazing Job, I can not recommend them enough! 10/24/2018 The Jerry's Kitchen team maintained great communication leading up to the event and came through the day of our opening. Everybody loved the cold trays with hoagies and sandwiches and also enjoyed the hot items that were being served out of the food truck. Several people made comments about how great the food was and when our event was over, their team came in and helped clean up. 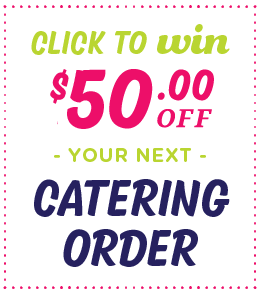 If you are planning an event and need catering definitely consider Jerry's Kitchen. 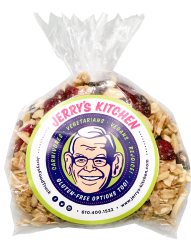 10/23/2018 Jerry's Kitchen provided food for a corporate recruiting event. They arrived on time and the food was delicious. Scott was easy to communicate with when setting up and responded quick and accommodated all of our needs. Thank you so much for everything! 10/18/2018 The food was delicious! They were professional and wonderful to deal with. I would definitely recommend Jerry’s Kitchen. 10/13/2018 Great experience from quote to day of event. Crispy Chicken and the Pulled Pork Sandwhiches were a fave - along with the french fries. Awesome way to throw a party! 10/11/2018 I worked with Scott from Jerry's Kitchen to customize an Oktoberfest menu for our party. Scott was so accommodating and made the menu very special. On the day of the event, Rob and his crew fed everyone quickly and orderly. And the food was amazing. I received so many compliments. The portions were huge and people were excited to tell me what they tried and how much they liked it. The whole process couldn't have run any smoother. 10/09/2018 Jerry's Kitchen was one of my favorite parts of our wedding! I loved that I loved my food! The portions were HUGE and so good! All of our guests absolutely loved the food truck. They made the food fresh and in a decent time keeping the lines manageable. My only regret is that I didn't have room for seconds! 10/01/2018 We had Jerry's food truck for our wedding, and we were very happy with our experience. The communication was excellent during the scheduling/ordering process and our guests were very pleased with the food. 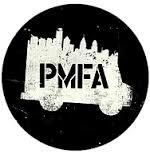 I would definitely recommend them for any event. 09/29/2018 Food was excellent Servers were very helpful, worked hard, cleaned up well and were extremely flexible with our schedule changes The whole process of scheduling, menu choices and payment were simple and not overly complicated. Thanks for awesome wedding food, service and reliability. 09/26/2018 Having Jerry's Kitchen cater our wedding was definitely one of the highlights of the night! Everyone keeps telling us how fun it was that we had a food truck, as well as just how tasty the food was. I'm not sure how it's possible - but it tasted even better the night of our wedding than it did during our tasting! During our honeymoon, my husband and I kept talking about how much we loved it. Scott is the best, and we'd definitely use Jerry's Kitchen again. 09/26/2018 Great experience catering our University club event. The team is very responsive and easy to work with. Thanks! 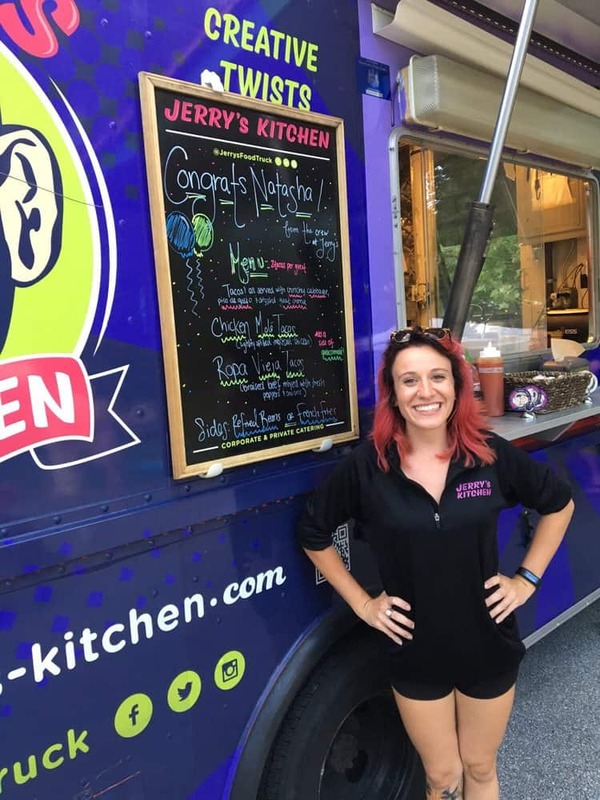 09/18/2018 We hired Jerry's Kitchen for our company picnic. The event was AMAZING thanks to Jerry's Kitchen. Food A+++, Service A+++, honestly, nothing bad to say about our experience from the first contact till they left the event. I would absolutely recommend them and will probably use them again for future events. 09/14/2018 Scott, the owner is very friendly and helpful. The food was good for our work event that we had. They were on time and ready to go when it was time to start our lunch shifts. 09/10/2018 Jerry's Kitchen provided lunch for our employee appreciation / back to school luncheon. The staff were great! They were pleasant and very accommodating for staff with special dietary needs. The food was good. The whole experience - from planning to execution - went smoothly. Scott was a pleasure to work with! I would highly recommend Jerry's Kitchen! 09/09/2018 I highly recommend Jerry’s Kitchen!! Their customer service and food quality are amazing! I rented a food truck for my backyard wedding and it was a total hit. Scott followed up with me multiple times before the big day to make sure I was comfortable and taken care of. Charlie was our food truck chef and he is absolutely amazing. He is laid back, calm and professional. His food is incredible (rave reviews from all guests) and he is a joy to work with (as was Scott). Can’t thank you enough! 09/03/2018 Great food for our wedding after party! 08/27/2018 We hired Jerry’s Kitchen for my sister’s bridal shower last weekend. The truck was amazing. The staff was great. They came early and were very courteous. All the food was delicious. I would definitely hire them again and reccomend them to anyone! Thanks again!! 08/27/2018 Great food, great staff. 08/19/2018 We had Jerry's Kitchen food truck cater our daughters first birthday party and they were amazing. Scott was always quick to respond to my emails leading up to the party which helped make the planning very smooth. The food truck showed up early to set up and began serving guests right on time. The day went perfectly and I was free to enjoy myself. The food was great, our guests were full and happy, and the Jerry's kitchen staff were very accommodating to all of my guests needs. Thank you so much! 08/15/2018 Great communication and loved the food! 08/13/2018 This past weekend we had Jerry's Food Truck cater our first annual company picnic. Needless to say, it was GREAT! Scott was awesome to work with and was very accommodating with the limited time we had to plan it. We opted for Cheesesteaks, Veggie Quesadillas, and Chicken Sandwiches. Everything was done to perfection! We will definitely be using them again. 08/11/2018 Everybody was very nice and the food was awesome. 08/06/2018 I had Jerry's Kitchen at my daughters first b-day party. It was a huge success!!! The food was good and my guests loved it. The truck was clean and well kept. I have received so may calls commenting on how cool and different the food truck was - I had over 100 guests and everyone was served within the 2 hour time frame that the truck was at my house. Cleaning up after party was over was no problem at all. No mess in the kitchen!!! I would definitely recommend Jerry's kitchen for any party!!!! 08/02/2018 delicious food. get the watermelon salad! great experience. would definitely use again! 08/02/2018 Everyone was so helpful and caring of our roommates with Down syndrome!!! Thanks for everything! 07/29/2018 Staff was on time and great to work with! Food was great and fresh, especially the few added salads. Thanks for a great evening! 07/27/2018 Service was great food was fantastic!!!!! The staff said everything tasted so good, the portions were enormous and tasty. They arrived an hour early to set up and were ready to serve early. Thank you for an amazing event with amazing food. 07/23/2018 It was a fantastic experience! Even the pouring rain didn’t discourage the party! Food was delicious and made the party so easy for us! 07/22/2018 This was our second time using Jerry's Kitchen, the first for my wife's 30th birthday and this time for our son's 1st birthday. Jerry's has only gotten better from our first experience! The food is fantastic, the menu is huge there is certainly something for everyone and the staff is absolutely the best. Professional and personable from start to finish, Jerry's is the best food truck around! 07/20/2018 Jerry's Kitchen catered meals for our summer camp. The staff was wonderful to work with and the food was delicious! I highly recommend hiring Jerry's Kitchen! 07/18/2018 We had a Jerry's Kitchen food truck cater a company lunch for about 120 staff members. Wonderful experience from the beginning! The manager was very easy to work with on scheduling and menu. The serving team was friendly, professional, and efficient (it took about 5 minutes to order and receive your food). And the food itself was, in the words of our staff, "amazing, AWESOME, DELISH". Thank you Scott and Jerry's Kitchen for helping to make this a fantastic event! 07/16/2018 Excellent experience! Great food and very nice people to deal with. On time and so great to not have to worry about clean up! Would recommend Jerry’s Kitchen!! 07/16/2018 Wonderful experience. Truck showed up to open up just as we needed it too, we had a lot of cancellations so people took food home for dinner or lunch and staff was very accommodating. Everyone raved about the food- massive portions. Will definitely use again! 07/10/2018 Very good...People loved the food, especially the chicken sandwich! Thank you for a fabulous second year at the BIA picnic! 07/09/2018 We ordered the tacos (Carnitas, Smoked Chicken and Roasted Cauliflower) with Chips/Salsa and Fried Plantains as sides. Quality food. Quick service. And they were able to accomodate 15 extra people on spot which was nice. 07/08/2018 Such a great experience with Jerry’s Kitchen!! Food was awesome and service was amazing!! We loved everything!! 07/06/2018 An absolutely wonderful and stress-free experience from start to finish! Scott was wonderful to work with. The food was delicious and our guests loved the entire food truck experience! Such a memorable part of our daughter’s graduation party. 07/05/2018 Thank you for arranging for Chewy’s Food Truck to come to our 4th of July/ graduation celebration! The food and service were amazing and The guys were awesome on the truck! Made my day not having to cook or deal with the food cleanup! Food truck is the fun way to go for sure! Will do it again!!!! 07/05/2018 Jerry's Kitchen was fantastic for our wedding! Scott was so easy to work with leading up to the day. The communication was great, food was unbelievably delicious and it was nice to have a variety of menu options. People raved about the chicken sandwich all night! They made our wedding so unique and special- we would highly recommend them to anyone for any type of event. 07/01/2018 It was an overall great experience from the start of the planning process (very helpful and responsive with all my questions) until the last item served, EVERY guest raved about the food - DELISH! Minor glitch with an overheated truck on the way (98 degree day!?!?) causing a slight delay in arrival but the team was so great when they got here, got things moving quickly and made sure the guests were taken care of! We have another graduating next year and will use Jerry's again! Thank you!